Ask A Stylist: How can I wear the embroidery trend? Embroidered details have officially made their way from the runway and into our wardrobes. And, it’s not just for avid needle-pointers anymore! Read on to see how to rock this stitched trend from head to toe. See how to wear the embroidery trend this season! The perfect way to dip your toes into a new trend (without going overboard?)—accessories! Shoes, bags and scarves are all options to get started with the embroidery trend. Whether slides, wedges or a super dramatic strappy style, sandals with embroidered details help you maintain chic footing while nodding to this fresh trend. Feeling feminine? Floral embroidering strikes a romantic chord while stripes, geometric and even Aztec prints make a bold impact. Stylist Tip: Summer sandals with embroidery details can punch up an otherwise simple ensemble. Say ‘bye’ to bags that lack personality! Embroidered clutches, totes and top handles are taking over the purse scene this season. Flora, fauna and even catchy phrases (like au revoir!) will let you tote around your personality—literally. Get ready to elevate your everyday tees! This season, embroidered details like full-on floral decals or stitching around the neckline are making an appearance on everything from T-shirts to button-ups. Craving something that will play well with everything from your classic capris to your maxi skirts? 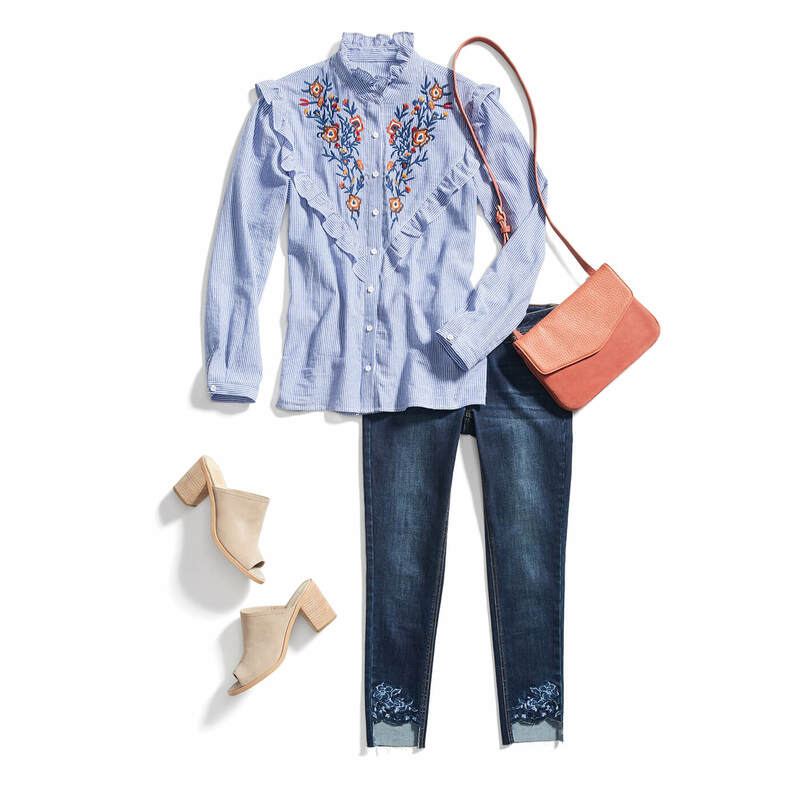 Look no further than the peasant blouse with tie-neck tassels and a flowing silhouette. It’s the carefree staple to add to your summer rotation. Extra adornments make this tried and true wardrobe staple better than basic. Look for jackets with floral detailing to show off your inner flower child. Has your daily denim routine become dull? Spiff up your usual outfit combo with some eye-catching details to take part in this boho-redux. Pretty pockets are the perfect entry-level foray into this trend. Slide your hands into something with a little bit of stitching—whether it’s just bold stitches or full-on designs. Once you’ve mastered embroidery on everything else, look to jeans with a bolder embroidered presence on the pant legs. These can stretch from your pockets to your knee, or beyond! Pair it with a staple tee before you head out the door. Will you try out the embroidery trend this season?